I have always believed that music breaks down barriers and brings people together. It allows us to get to know one another more intimately whether it’s on a personal level, local or global scale. Music also has a way of capturing memories and restoring them. I was born in the United States, however, my heritage stems from Eastern Europe. My Grandmother made the trek from Europe to America, by boat, with my mother and her two sisters after WWII. Just like many other immigrants who came to America, she was in search of a better way of life. I grew up in a non-religious household, however, we managed to preserve the traditional aspect of our religion by celebrating major holidays. And with every holiday there was always plenty of songs. Some of the songs were in the spirit of giving thanks for the food we ate and others were related to games we played. Even mystical characters got their own songs. Music played an integral role in bringing us together and helping us to better understand our roots. I have always loved World Music for its raw expression of the culture it represents and the diverse array of instruments used. Sometimes it is the only window we have into understanding a community of people. And even though I may not always understand the language, I believe the music speaks for itself. 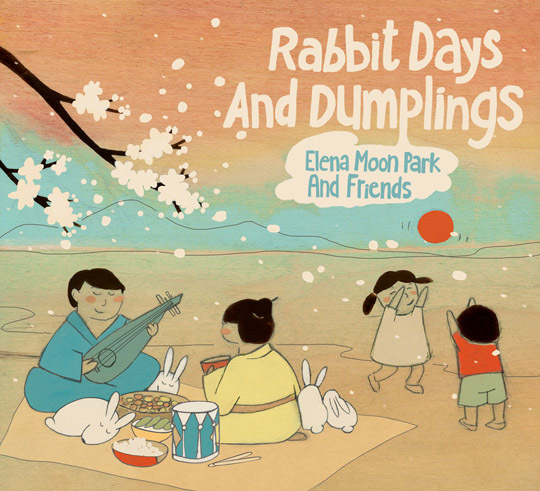 Elena Moon Park, a key player in the Dan Zanes and Friends ensemble, recently released her debut children’s album, Rabbit Days and Dumplings, which also won her a 2012 Parents’ Choice Award. Released through Festival Five Records (a label started by Dan Zanes in 2000), Rabbit Days and Dumplings takes us on a picturesque retreat, delivering a carnival of sounds from East Asia (Korea, Japan, China, Tibet and Taiwan) that have been reinterpreted and translated into a beautiful array of songs. No plane tickets necessary! Rabbit Days and Dumplings is a personal album built on Park’s exploration of her own cultural roots while also capturing “songs, styles, traditions, languages, instrumentation, stories and feelings.” Park further explains, “It’s a reflection of conversations with friends, learning about the songs they listened to growing up and the songs that linger in their memories.” Park, a Korean-American born in East Tennessee, pays tribute to both sides of her heritage by mixing traditional American folk music with traditional Asian sounds and vocals. Renowned collaborators such as the masterful Wu Man, Jean Cook (a violinist who plays with Elizabeth Mitchell & You Are My Flower), popular Tibetan singer/songwriter Techung, members of Bang on a Can and the Kronos Quartet, to name a few, are featured throughout the album further contributing to the authenticity of the cross-cultural landscape that makes up Rabbit Days and Dumplings. The album opens with “Sol Nal,” which prompted the making of Rabbit Days and Dumplings. This joyful song describes the many celebrations that happen around the Korean New Year. It is led by Park’s powerful vocals and backed by some of the members from Dan Zanes and Friends. Some of our favorite songs, in addition to the aforementioned “Si Si Sima,” include “Diu Diu Deng,” which features Dan Zanes on banjo and a fantastic solo by Wu Man on the pipa (a plucked Chinese string instrument). The song is about a train chugging into a tunnel as droplets of water fall from the ceiling onto the roof of the train. I particularly love the layering of English and Chinese vocals towards the end of the song. “Poong Nyun Ga,” one of my favorites on the album, features steady drumming from the Korean Traditional Marching Band of New York, trumpets, an accordion, a mandolin and a piri (Korean reed instrument) that mixes perfectly with the joyous crowd of voices that triumphantly sing in hopes of an abundant year (in the name of a plentiful harvest or good luck in general). The vibe of the song is infectious and I can’t help but clap and sing along every time I hear it. Of similar sound is the brassy New Orleans style of “Diu Shou Juan,” a Chinese song that typically accompanies a children’s game called Drop The Flag. Sung in Mandarin and English, “Diu Shou Juan” is an excellent example of Park’s ability to create a beautiful union of Eastern and Western cultures. Elsewhere, we get to hear Zanes and Park sing together in “Akatombo.” The definition of the title means “red dragonfly” and the song reflects on memories of a past time. It’s a beautiful song in which we get to wholly experience the depth of Park’s gorgeous voice. Paired with Dan Zanes’s soft, signature rasp, the song is quite moving. Winding down the album, Park also gives a nod to popular Western music with “Summer is Here.” The song’s composition reminds me a little of Neil Diamond’s “Sweet Caroline” for some reason (which, to me, isn’t a bad thing at all). It’s a charming song based on Park’s experience growing up in Tennesee, hiking through the mountains and eating kimbap, a food that resembles sushi. “Tinsagunu Hana” completes the album with an offering of gratitude for all the hard-working parents, including Park’s own, as she sings “…although we number all the stars in the sky we cannot count our parents’ words of advice.” Listening to this and thinking about all that I have learned as a parent myself I can’t help but think, “isn’t that the truth!” Although, I am going to make sure to play this one for my Mother, as well. I am truly impressed by the work that was put into making the album. Highly recommended for all ages. Rabbit Days and Dumplings is a timeless classic and one that fully supports Park’s strong belief that music has the ability to transcend borders, ages, languages and backgrounds. The album contains beautiful illustrations by Kristiana Pärn while the liner notes provide snippets of song lyrics, Asian script, phonetic representation and English translation, which makes it fun to follow along. Below is a sampler containing five songs from Rabbit Days and Dumplings. You can also find song lyrics and backgrounds for most songs on the album here. The album can be purchased from Festival Five Records, as well as the other usual outlets. A portion of the proceeds will be given to DonorsChoose.org to support creative education in our schools. Full Disclosure: I was given a copy of the album for possible review, however, the opinions and thoughts expressed throughout are my own.